I was assigned to go to sea on the R/V John N. Cobb as chief scientist on an exploratory hake cruise and we headed out the Straits of Juan de Fuca in the late afternoon of September 19, 1966. After dinner I made up my bunk, preparing myself for a four week trip off the Washington and Oregon coasts, and after meeting with the skipper and discussing where we would start work in the morning went to my stateroom and settled in for the night. We had decided to be at a location south of Cape Flattery, about halfway down the Washington coast off Cape Elizabeth, at sunup to start scouting for a fish called Pacific hake which is now known as Pacific whiting, Merluccius productus. At the time it was an undesirable American food fish, but an untapped industrial resource for fish protein concentrate or fish flour. Our assignment was to locate the resource to assist four Pacific coast vessels fishing hake which were to be delivered to a special plant in Aberdeen, Washington, for processing. I woke because of the change of engine noise as it was put into neutral; we had been running at a constant cruising speed for some time and the motion of the vessel was different as we drifted. I felt us rise slowly as a swell lifted her and then gently fall as it passed. I got out of my bunk, dressed and went up the steps to the pilot house, sensing the coming daylight as I came onto the bridge where Pete, the skipper, said “We have company” and as I looked out the pilothouse windows I saw a sight that stunned me. There was no wind; the sea had a slow glassy swell. To the east was the coast of Washington State with the Olympic Mountains in the background, with the sun starting to show above the horizon and reflecting off the ocean. Everywhere else there were ships, a huge fleet of Russian ships and as the sun rose the red hammer and sickle on the stacks seemed to glow from the reflection. It was a Russian city as close as three miles off the coast of Washington, unbelievable during the cold war when we saw only a vessel or two when we worked there or transited though the area. A 125’ Russian side trawler, a rarity on the Pacific coast, crossed our bow, looking us over. It was fascinating seeing such a vessel in our waters after reading about them in the fisheries literature. It was low in the water, the house aft with a flush deck, with trawl doors hanging from fore and aft stanchions on the starboard side. The vessel ran smoothly through the water, lifting on a swell and rolling to starboard toward the Cobb. The trawl winches just forward of the house could be seen with hatches and checkers forward of them. She was long and low like a canoe, pointed at each end. There were more vessels of this class, cloned from the same mold, a ship referred to as an SRT. They were catchers, not processors, so their catch had to be off-loaded that day to a processing ship anchored nearby. Looking around I saw other classes of side trawlers as well as a few of the new 280 foot stern trawlers, a new concept to the distance water fleets of the world. They were large, high and long with a stern ramp where the trawl net would be hauled, dragging the catch up behind similar to whaling factory ships that pulled up the carcasses to be butchered. Once the fish were on the upper deck they would be dumped through a hatch to the factory below decks to be processed, frozen and stored in the freezer holds as food fish. The waste would go to the fish meal plant, dried, bagged and stored in a dry hold. Livers from the gutted fish would be converted to oil, using all of the waste product. 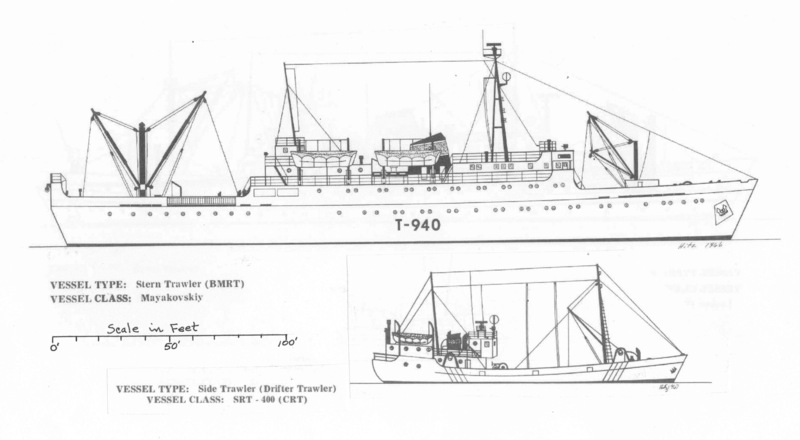 Again the ships seemed to be cloned, numbers of the same class of stern trawler seen, mainly the Mayakovskiy class. In the distance were processors, the freezer ships and support vessels making up this enormous distant water trawl fleet working off the Washington coast. It was unbelievable that they were there. They had found the hake concentration we were there to scout and this fleet of at least 50 ships was taking them. What chance could four west coast combination fishing vessels have and what about our other fisheries? What effect would this have on them? Looking back at this moment in history, 1966 was the catalyst year that changed the American fishing industry. In my lifetime the fisheries have gone through a tremendous transformation. The territorial sea’s three mile limit was changed to 12 miles and the 200 nautical mile Exclusive Economic Zone (EEZ) was put into effect. The Magnuson-Stevens Act became law and has since been modified a number of times. The Pacific coast fishing fleet was changed to become catchers for the larger foreign factory ships through joint ventures. They would pass the freshly caught fish by disconnecting the full cod end of the net and floating it over to the foreign factory trawler to be hauled up the stern ramp and dumped into the factory below. 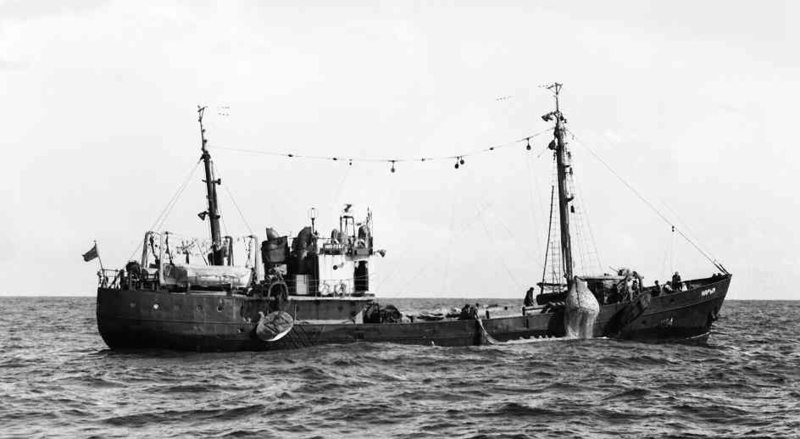 In time we Americans modified our fleet by building factory stern trawlers ourselves and phasing out the foreign vessels working on American fishing grounds in the EEZ. Biologists were put on the foreign vessels as observers to keep track of the catches and make sure they observed the U.S. law regarding salmon and halibut. All these changes came about because the Russian fleet appeared off the Washington and Oregon coasts in 1966. 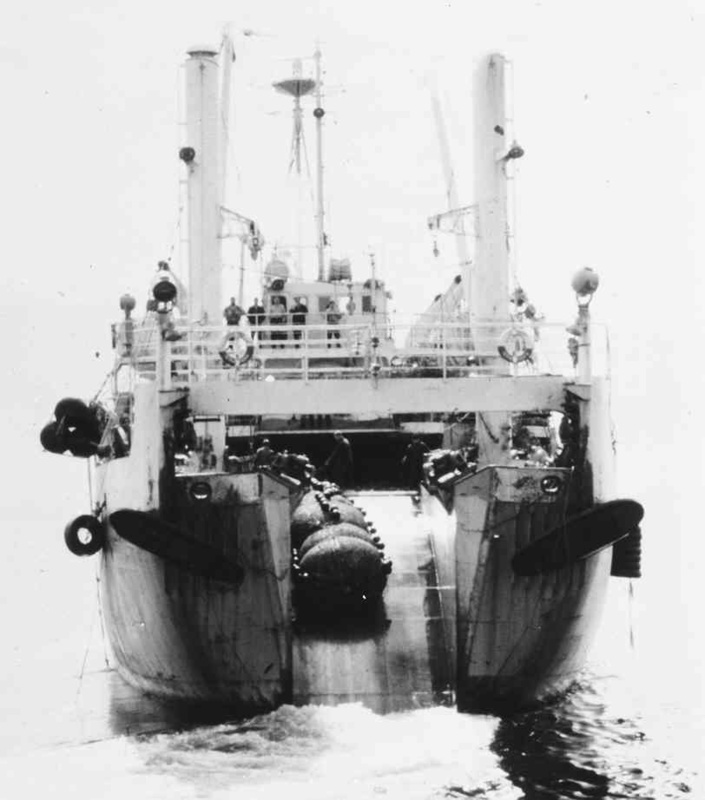 (1) Hitz, Charles R. 1970 Operation of the Soviet Trawl Fleet off the Washington and Oregon Coasts during 1966 and 1967. U.S. Fish and Wildlife Service, Circular 332. 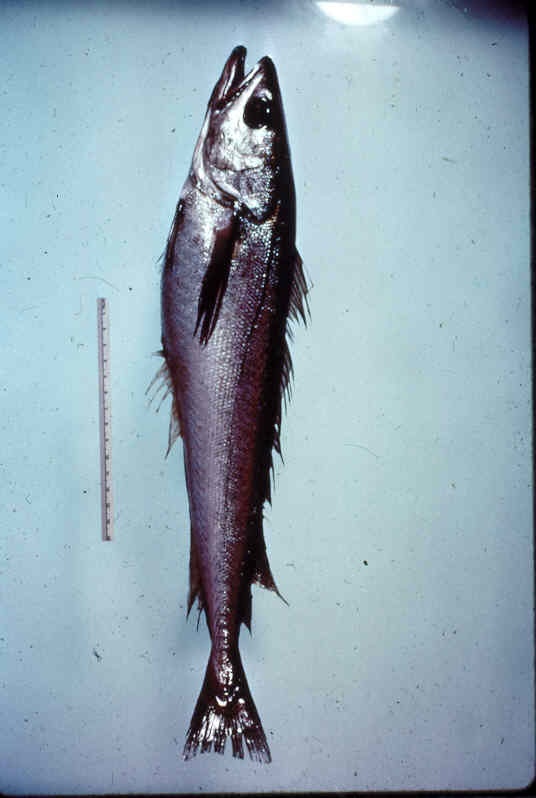 (Note): The figures are from the archived information of the R/V John N. Cobb Exploratory & Gear Research unit stored at the NOAA’s, NMFS, Alaska Fisheries Science Center at Sand Point in Seattle, WA. A Soviet fishing boat off the Oregon coast in 1966. This entry was posted in Cold War, Environmental History, Fishing, History of Science, History of Technology, Ocean fishing, Overfishing, Pacific Fishing History Project, R/V John N. Cobb, Rosefish, Sebastes rockfish, Soviet environmental history, Soviet fishing, Soviet history' and tagged Cape Flattery, groundfish, hake, Mayakovskiy class, Strait of Juan de Fuca, trawling. Bookmark the permalink. Would you like to write about it? I’d love to know more.